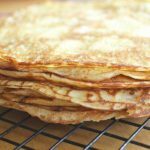 I used to think making crêpes, those very thin pancakes containing an assortment of sweet or savory fillings, was an activity best left to the expert cook. Or the adventurous cook. Or, at the very least, for the slightly masochistic cook eager to spend hours on one’s feet negotiating batter consistency and disc thickness in the ultimate quest to create something that could easily be purchased from a street vendor in Paris. So imagine my surprise when I discovered they were a breeze to make! I learned this rather abruptly one day from my sister Elena, by far the most accomplished cook in my family. What, no perfect whisking required? I almost felt a little deflated upon hearing this. It definitely took a little of the mystique out of it for me, to tell you the truth. Even so, I spent the following day in the kitchen with my food processor as my only companion. Using equipment no more exotic than a nonstick skillet, my trusty KitchenAid and toothpicks to flip the crêpes over, I made many, many crêpes. I quickly learned that the batter is actually rather sturdy and flips over quite eagerly with a little assistance. I had envisioned the discs being much more fragile, and feared they would disintegrate when I attempted to flip them, but they ended up being real team players. Encouraged, I made so many crêpes that we ended up eating them, with different combinations of fillings, for what seemed like eternity. Even so, no one tired of them. How could we? It’s almost impossible to tire of crêpes since the choice of fillings is as boundless as photo ops are for Kim Kardashian. Spinach and ricotta, meat, and mushrooms are among the most popular savory fillings, though why not consider using goat cheese, roasted red pepper slivers and fresh thyme or basil? The chocolate spread Nutella and fresh fruit tend to dominate the sweet versions, though personally I would devour one filled with sweetened, lemon-zested ricotta and doused with powdered sugar. Crêpes also offer variety in the visual department. You can serve them folded over once or twice like a half moon or a dinner napkin, rolled up either evenly like a cigar or unevenly like an ice cream cone. Or, you can use them flat and layered, in place of sheets of pasta. That’s a whole lotta range for a little disc. Finally, crêpes are particularly outstanding when entertaining. 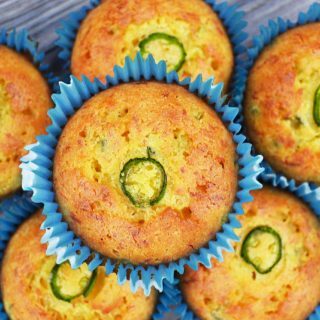 They can be prepared up to 3 days ahead and can be thrown in the oven while chatting with friends and negotiating a slightly dirty vodka martini in one hand. 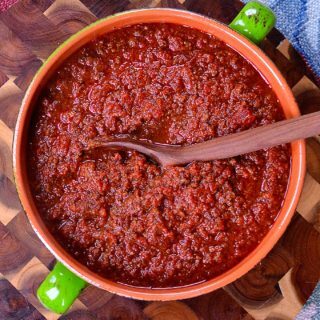 Within minutes, an exquisite aroma permeates your kitchen and dining room, romancing your guests to the table by titillating their appetites. 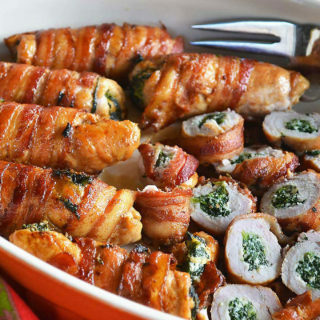 You also get to enjoy some adoring ohhhs…and ahhhs…when you present the dish at the dinner table. 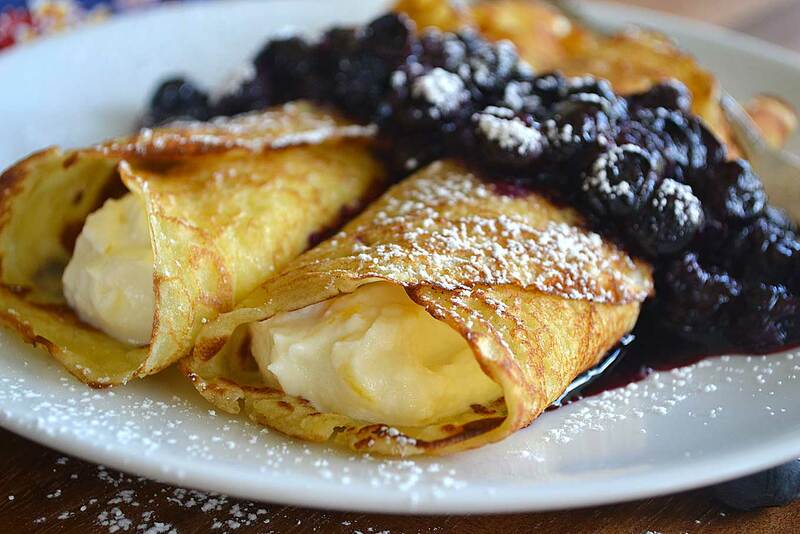 Crêpes do have cachet, after all. 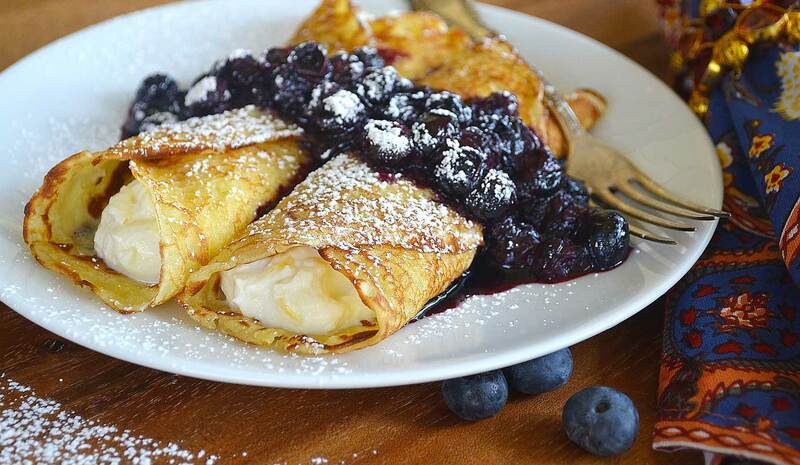 Of course…the cachet comes at a bit of a price, labor-wise, when making this particular dish because you need to make the crepes, the ricotta filling and the blueberry compote before you can assemble this little masterpiece of incredible, make-your-eyes-pop-out-of-your-head deliciousness. The good thing is that you can make all 3 things up to 3 days ahead of time, so that you don’t have to use up a huge chunk of time all at once. 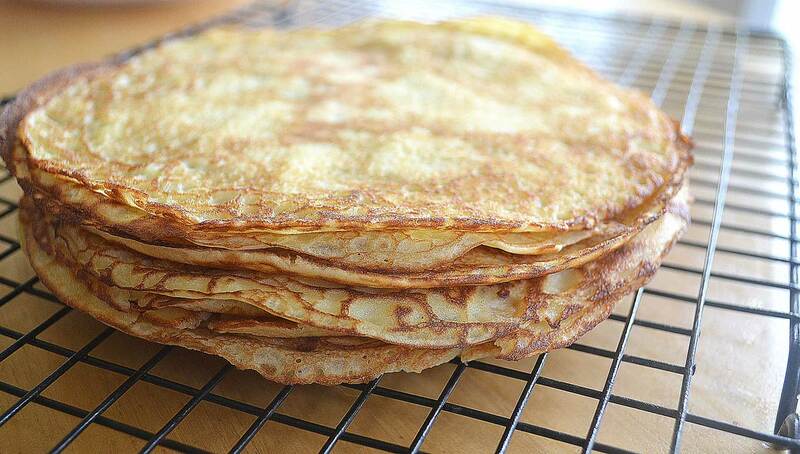 You can even make the crêpes several weeks ahead of time and just freeze them, which is quite helpful. When I get into crêpe-making mode, I make a gazillion of them because I want to maximize dirtying the food processor. Really. For no other reason. I am THAT lazy. So I make a whole bunch and then have a wonderful time figuring out how to fill them for a week or so. It’s a wonderful puzzle to solve, I can tell you that. And there you have it. With a little planning, you can spread out the work over a couple of days and than assembling the dish becomes a breeze. So let’s first start with making some ultra-light crêpes. 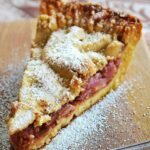 I discovered this recipe years ago in Julia Child’s The Way To Cook. It produces a lighter and more delicate disc and I have been using her suggested ingredients ever since for my sweet crêpes. I do not follow her whisking instructions, however. I just throw everything in my food processor and mix it up for a few seconds. It works beautifully, and easily!, every time. 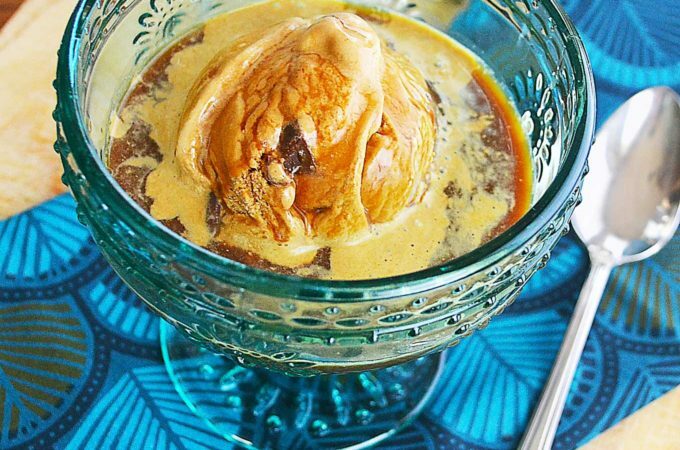 Place 2 large eggs, 2 egg yolks, 1/2 cup of milk, 1/2 cup of water, 2 tablespoons of granulated sugar, 3 tablespoons of melted unsalted butter, 2 tablespoon kirsch, bourbon whiskey or rum (optional) and a pinch of salt in a food processor. Add 1 cup of unbleached white flour. I add this last because I’ve learned that adding flour on top of the liquids prevents it from accumulating on the bottom of the mixer and not mixing well with the other ingredients. Mix until well blended, 10 seconds or so should suffice. Now, Julia says to allow the batter to rest for 10 minutes or so before starting to make the crêpes, but to be honest…I’ve forgotten to wait probably more times than I remembered to wait and it never seemed to make an ounce of difference once they were cooked. Honest engine. Melt 2 tablespoons of unsalted butter in a Pyrex measuring cup in the microwave (usually 20-25 seconds do the trick). Now heat a 6-inch nonstick skillet until a drop of water dances on it, and then brush it lightly with the melted butter. 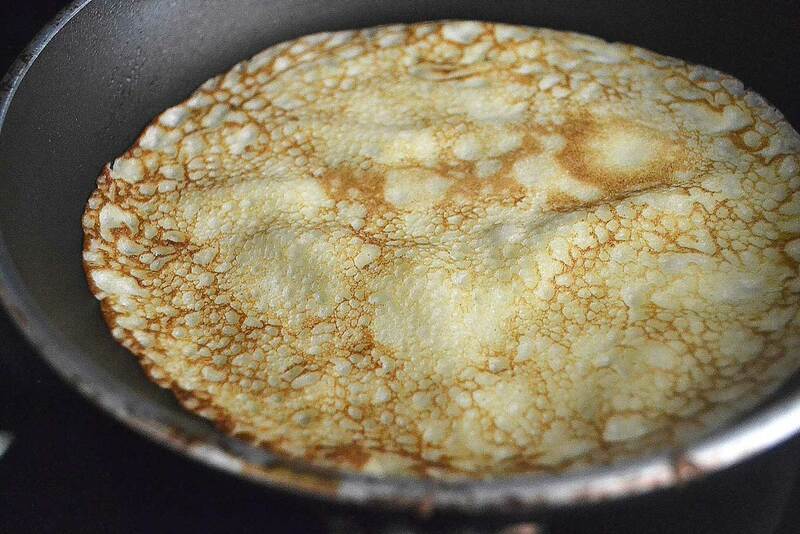 Pour a little less than a ¼ cup of crêpe batter into the center of the hot skillet. 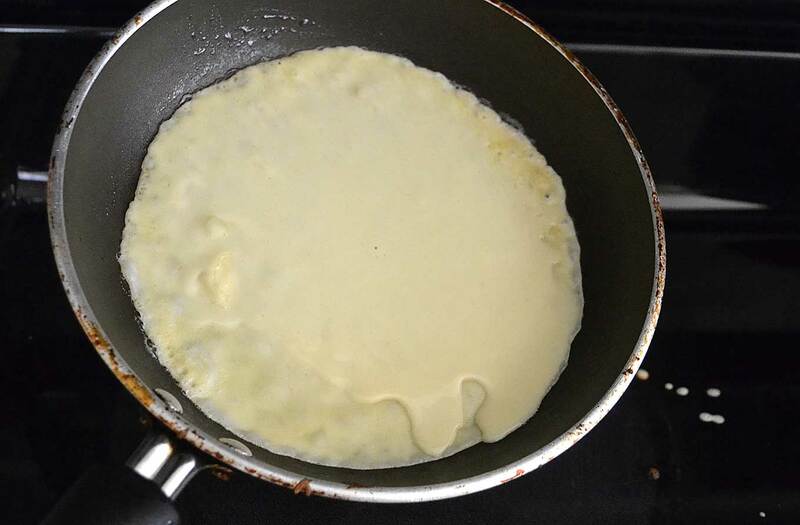 As you do this, make sure you have picked up the skillet and are tilting it in all directions as you pour the batter. I cannot underscore the point enough that you really need to do both things at the same time. Doing both things simultaneously is very important because it helps to spread the batter evenly throughout the skillet. By doing so, the batter will cover the entire skillet in a light coating, which is also how you get that pretty round! 🙂 Let it cook for 30 seconds or so until it is lightly browned. 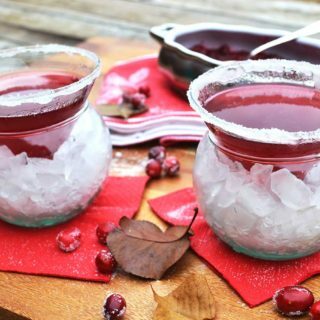 Gently lift an edge with a toothpick or spatula to assess the color. Shake and jerk the pan by its handle to dislodge the crêpe, then turn it over either with your fingers, spatula or toothpick. You can also flip it over by tossing the pan. I started doing that years ago and am now pretty comfortable and proficient doing it. Why…I almost feel like a professional! I will say that I did have a steep, did I mention steep?, learning curve when I first began flipping, so I suggest doing so over your kitchen sink. Just saying. Cook the crêpe for another 15 to 20 seconds. Transfer to a baking rack. When thoroughly cool, you can stack them with no fear of their sticking. 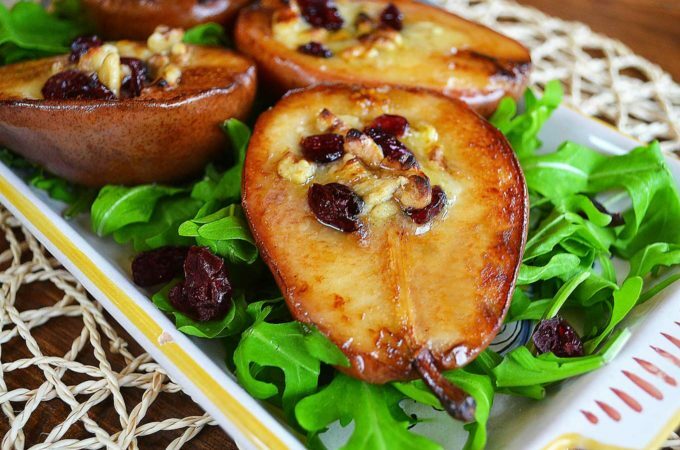 Refrigerate for up to three days or freeze for several weeks. Makes 10-12 crêpes 5 ½ inches across. Now we’re on to making the blueberry compote, which is a real snap. And by the way, while it’s perfect for dousing sweet crêpes, this delicious and runny blueberry marmalade is delectable over pancakes, waffles, French vanilla ice cream or just by itself on a spoon. You can spend some wonderful time figuring out how to indulge. Pour 1 ½ cups of fresh or frozen blueberries into a medium sauce pan. Add 3 tablespoons of water and 3 tablespoons of sugar and cook over medium-high heat. Once boiling, reduce to a simmer and cook for 10 minutes. Add 1 final cup of blueberries and cook for an additional 5-6 minutes to heat through. 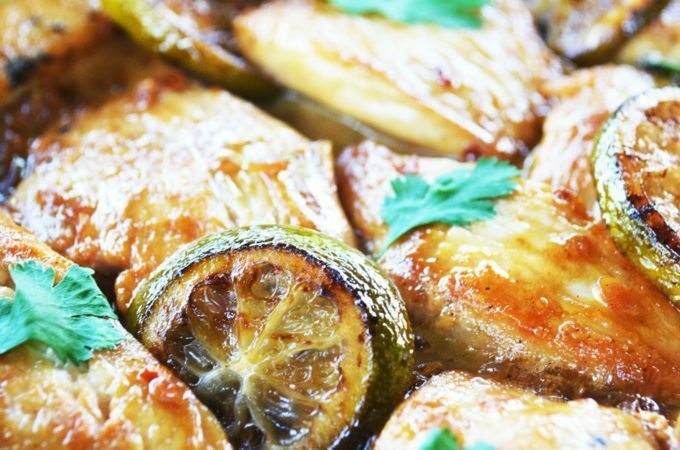 Add 1 teaspoon of fresh lemon juice, which brightens the sauce with its acidity and also helps the blueberry flavor to pop even more. Mix well. Serve warm. 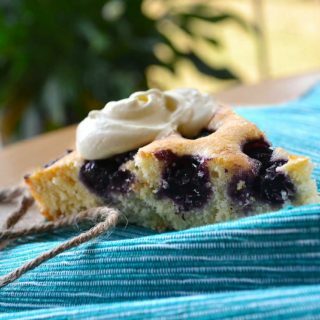 While the blueberries are bubbling away, make the filling. 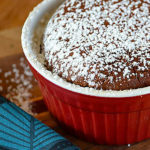 This ricotta filling is my personal favorite, hands down. 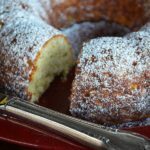 It’s light, creamy, not-to-sweet and has a subtle fresh, lemony taste. My only challenge is not eating it all as I’m preparing it to fill the crêpes. Strain 4 cups of whole milk ricotta cheese in a fine-mesh strainer over a small bowl in the refrigerator for 30 minutes to remove excess water. Click here if you want to make your ricotta from scratch. 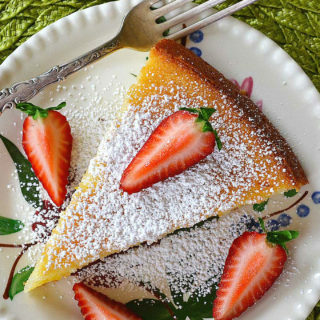 Place the ricotta in a medium-sized bowl and add 1 teaspoon of vanilla, the zest of 1 lemon, and 3/4 to 1 cup of powdered sugar (depending on how sweet you want it). Mix well. Chill in the refrigerator for at least 30 minutes. Lay out each crêpe on a flat surface and spoon a generous amount of the ricotta filling, create a line of filling that ‘slices’ each crêpe in half as you do this. Then roll it up, flipping one side over the filling and then the other. 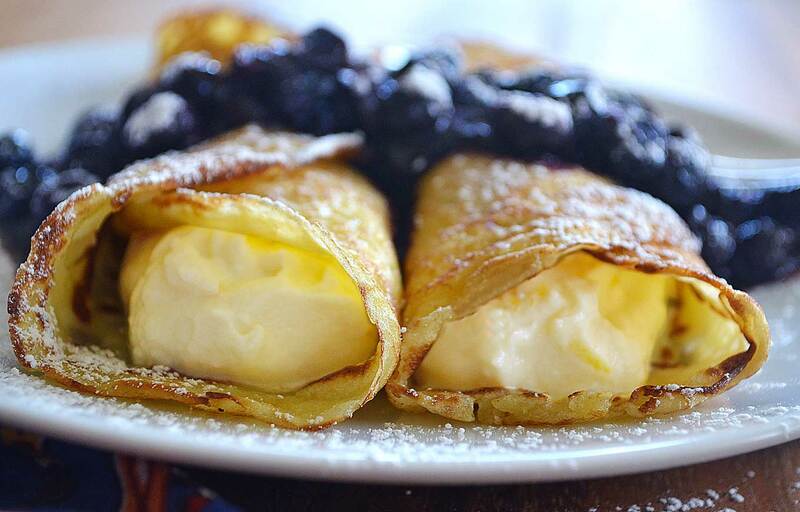 Assemble two crêpes on a dessert plate and then add the blueberry compote and sprinkle with powdered sugar. Makes 5 to 6 servings. 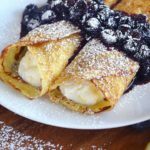 Assemble two crêpes on a dessert plate and then add the blueberry compote and sprinkle with powdered sugar. Yield: Makes 10-12 crêpes 5 ½ inches across. 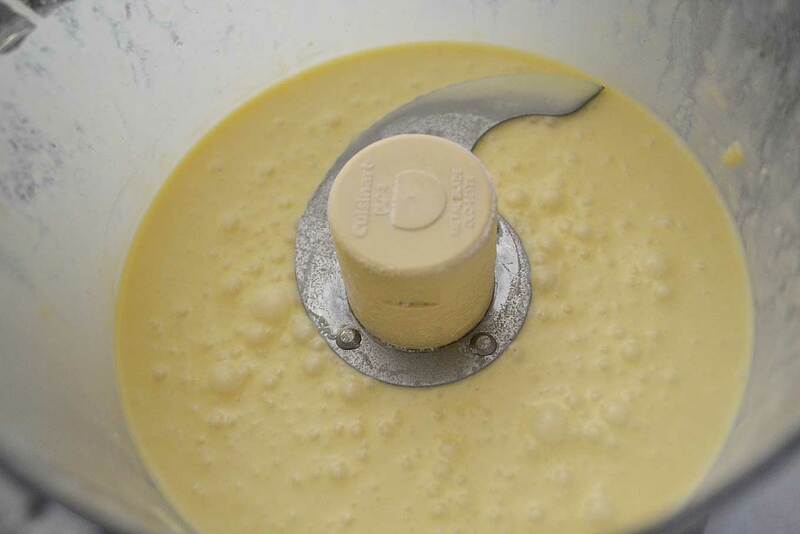 Add eggs, milk, water, butter, optional liquor, optional sugar and salt in a food processor. Mix well. Now add flour. 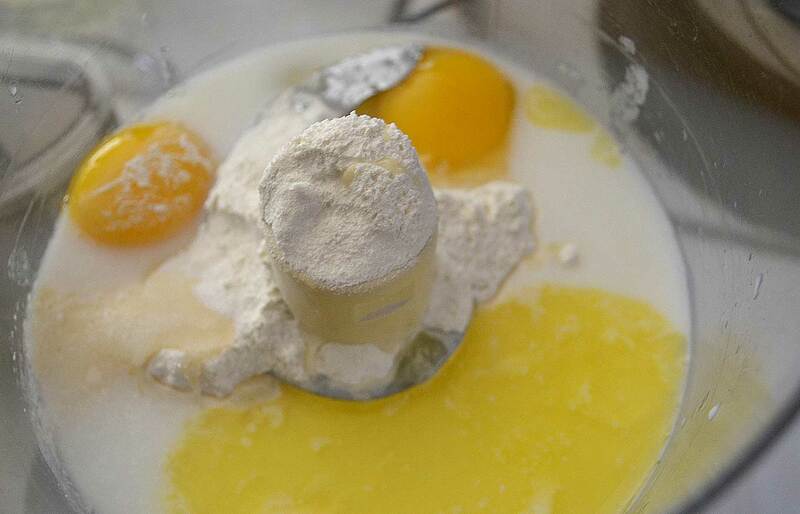 Adding the flour on top of the liquids will prevent it from accumulating on the bottom of the mixer and not mixing well with the other ingredients. Mix until well blended, 10 seconds or so should suffice, and allow the batter to rest for 10 minutes. Melt 2 tablespoons of unsalted butter in a Pyrex measuring cup. Heat a 6-inch nonstick skillet until a drop of water dances on it, and then brush it lightly with melted butter. Pour a little less than a ¼ cup of crepe batter (about a 1/3 of an inch less) into the center of the hot skillet WHILE tilting the skillet it in all directions. Doing both things simultaneously is very important because it helps to spread the batter evenly throughout the skillet and also creates a perfect circle. The batter should cover the entire skillet in a light coating. Let it cook for 30 seconds or so until it is lightly browned. Gently lift an edge with a spatula to assess the color. Shake and jerk the pan by its handle to dislodge the crêpe, then turn it over either with your fingers, spatula or toothpick. You can also flip it over by tossing the pan. Cook the crêpe for another 15 to 20 seconds. Transfer to a baking rack. When thoroughly cool, you can stack them with no fear of their sticking. 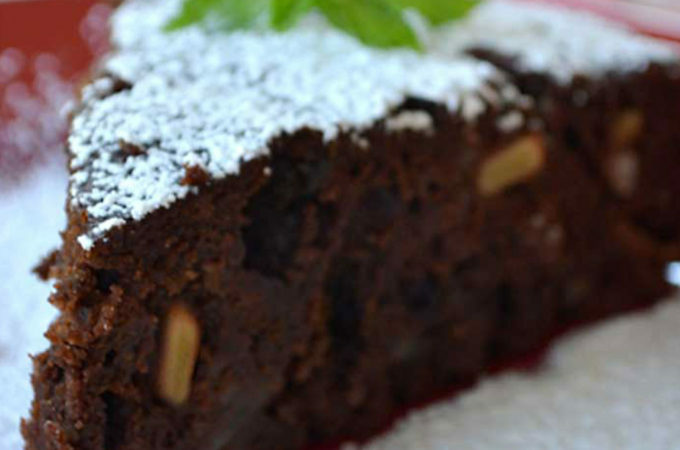 Refrigerate for up to two days or freeze for several weeks. Make the filling by placing the ricotta in a strainer over a small bowl and letting it drain in the refrigerator for 30 minutes to remove excess water. 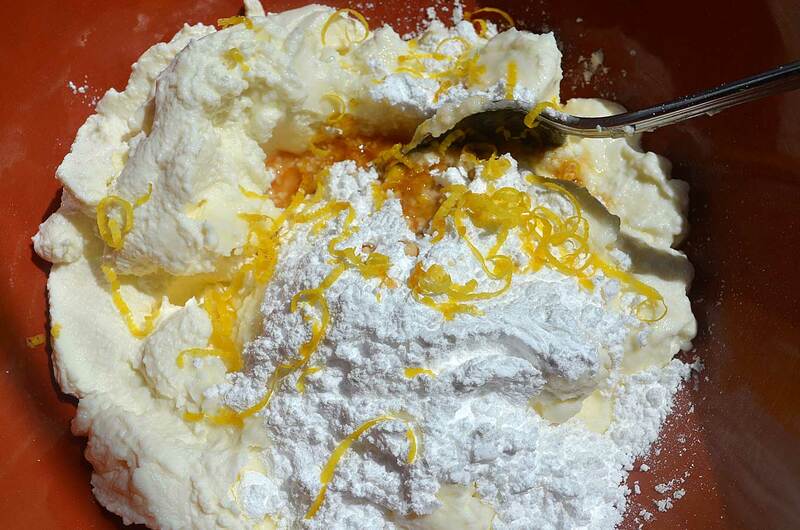 Mix the ricotta with the powdered sugar, vanilla and lemon zest. Chill in the refrigerator for at least 30 minutes. Pour 1 1/2 cups of blueberries into a medium sauce pan. Add 3 tablespoons of water and the sugar and cook over medium-high heat. Once boiling, reduce to a simmer and cook for 10 minutes. 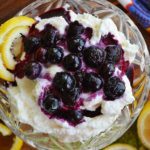 Add the remaining 1 cup of blueberries and the lemon juice, which brightens the sauce with its acidity and also helps the blueberry flavor to pop even more. Mix well. Serve warm.